The ability to convert one cell type into another has caused great excitement in the stem cell field. Two main techniques exist: one reprograms somatic cells into pluripotent stem cells (iPS cells), the other converts somatic cells directly into other types of specialized cells (transdifferentiation). These techniques raise high hopes that patient-personalized cell therapies will become a reality in the not-so-distant future. The first technique, developed by Yamanaka in 2006, makes it possible to convert essentially any cell type in the body back into pluripotent stem cells that are almost identical to embryonic stem cells. This is done by adding a quartet of proteins: the transcription factors Oct4, Sox2, Klf4 and Myc. The resulting iPS cells can be grown and multiplied almost indefinitely without losing their potential to differentiate (or change) into a broad range of cell types. 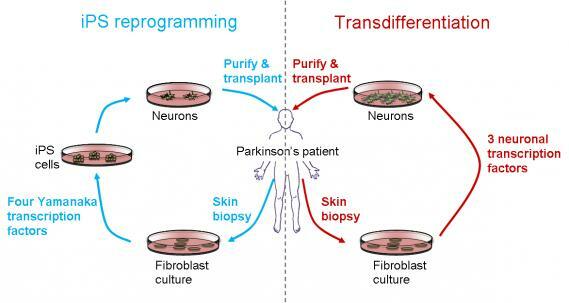 If a clinician wanted to use this technology to treat a patient with say, Parkinson's disease, she/he would prepare a skin biopsy, grow skin-derived cells called fibroblasts in the lab, introduce the Yamanaka combination of four proteins and wait a couple of months for the formation of stable populations or iPS cell ‘lines’. Since iPS cells can proliferate indefinitely, they can be isolated relatively easily and a small initial population can be used to produce a large number of cells. In our hypothetical Parkinson’s treatment, the multiplied iPS cells would then be made to differentiate into dopaminergic neurons, the cell type that is deficient in Parkinson's patients. As a final step the neurons would be purified and injected back into the patient. Comparison of iPS reprogramming and transdifferentiation: These processes might eventually be applied in the clinic for cell replacement therapies. An alternative to the iPS procedure is transdifferentiation. This approach uses transcription factors to convert a given cell type directly into another specialized cell type, without first forcing the cells to go back to a pluripotent state. 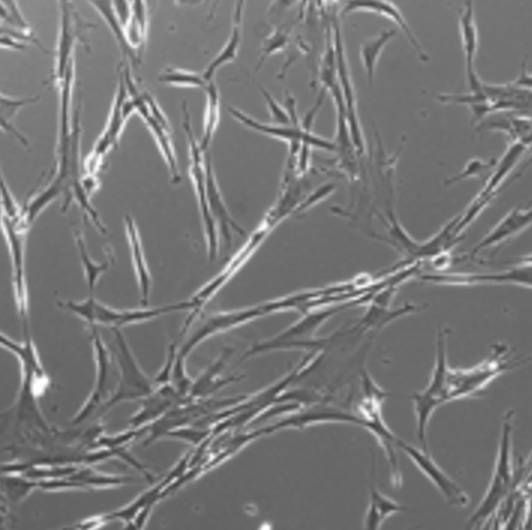 Research in the 1980s and 90s showed that fibroblasts can be converted directly into muscle cells at very high efficiencies using the transcription factor MyoD. Similarly, scientists found they could use a transcription factor called C/EBP alpha to turn lymphocytes into macrophages (different types of white blood cell). However, this transdifferentiation approach has only more recently taken off in the stem cell community. One reason for the slow start is that it took the Yamanaka experiments on iPS cells to convince many skeptics that cell reprogramming is possible at all. Another is that for a long time it seemed that direct conversions could only be achieved between 'sister cells', such as between two types of blood cells. The relationship between cell types is sometimes pictured as a developmental or ‘epigenetic landscape’. Landscape of development: The four main germ layers in which cells develop are divided by ‘tectonic plates’. Transitions between cell types are hardest when they cross over tectonic plates. See also Graf & Enver, 2009 and Waddington, 1957. In this view, pluripotent cells (iPS cells and embryonic stem cells) sit at the very top of the landscape and can produce cells that roll down the valleys to convert into the different types of specialized cells sitting on the bottom. Once the cells are settled in a particular area, travelling across a ‘mountain ridge’ into a different region to become an unrelated cell type is a tough challenge, but as mentioned before, ‘sister’ or ‘neighbouring’ cell types can be moved relatively easily over a small hill from one neighbouring valley to the next, given the right encouragement. This restriction to 'small jumps' between related cell types kept transdifferentiation within the realm of basic research studies. Then, in 2010, another barrier was broken when a group of researchers at Stanford demonstrated that a combination of three neural transcription factors can induce 'large jumps' between distantly related cell types by converting fibroblasts into functional neurons, cell types that belong to different germ layers. 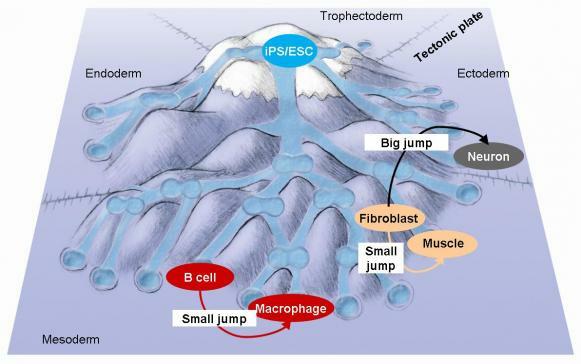 This study showed that cells can be pushed to traverse ‘tectonic plates’, opening up the prospect that any desired specialized cell could be generated from essentially any other cell type, once the right transcription factor formula is known. Since then, several other transitions across germ layers have been reported. "The iPS approach will make it into the clinic first"
So, which of the two approaches – iPS or transdifferentiation – will make it into the clinic, and which will be first? Because both technologies are patient-specific, there is virtually no risk of immune rejection. However, there are a number of hurdles that must be taken regardless of the technique used. For example, reprogrammed cells must be free of vectors inserted into the DNA that can potentially cause mutations and thus cancer. The cells produced must also be fully functional, engraft efficiently after transplantation and survive long-term. For these and other reasons, not all degenerative diseases might be amenable to treatment with cell replacement strategies. The iPS approach has the advantage that it permits obtaining large numbers of cells. Also, genetic defects can be corrected at the iPS cell stage, meaning that specialized cells made for the patient would no longer have the defect. A disadvantage is its complexity, high costs and the length of time required to produce first iPS cells and then the specialized cells needed for transplantation. There is also a risk that residual iPS cells in the transplant could cause tumors. However, recently there have been major advances to bring pluripotent cell technology closer to the clinic. For example, in ongoing clinical trials, teams in the US and Japan have transplanted retinal pigmented epithelium derived from embryonic and iPS cell cultures into the eyes of patients with inherited or acquired macular degeneration and preliminary results about improving vision are encouraging. The eye is a privileged site for transplantation since it is largely protected from immune attack. In other ongoing efforts teams in Japan, USA and elsewhere are developing iPS cell derived platelets to prevent thrombocytopenia, such as often occurs after chemotherapy of cancer. A major advantage of using platelets is that they have no nuclei, essentially eliminating cancer risk after transplantation. Other labs are engaged in developing methods to generate dopaminergic neurons and insulin-producing cells from pluripotent cells with the goal to eventually ameliorate or even cure Parkinson’s disease and diabetes. The main advantages of converting a specialized cell directly into another are the relative simplicity and short times required, reducing the costs in a clinical setting. However, most current protocols use retro- or lentiviral vectors to introduce combinations of transcription factors, with a danger of introducing undesired mutations. Here a promising alternative approach is to induce cell fate conversions by transiently expressing microRNAs (Victor et al., Neuron 2014), although this method is so far is limited to the generation of specific types of neurons. More generally, it is presently unclear whether it will be possible to generate the large numbers of specialized cells required for cell therapy via the transdifferentiation route, and whether the new cell types are of similar quality as those generated from pluripotent cells. In conclusion, it can safely be predicted that the iPS approach will make it into the clinic first. Time will tell whether specialized cells generated by direct cell conversions will also be eventually used for cell therapy. Film of a Thomas Graf lecture about his research at the National Institutes of Health, USA in August 2010. Waddington, C. H. The Strategy of the Genes, Geo Allen & Unwin, London, 1957. Landscape diagram provided by Debbie Maizels of Zoobotanica. Fibroblast image (header) by Tilo Kunath.